Can you ID Selasphorus hummingbirds by call note? 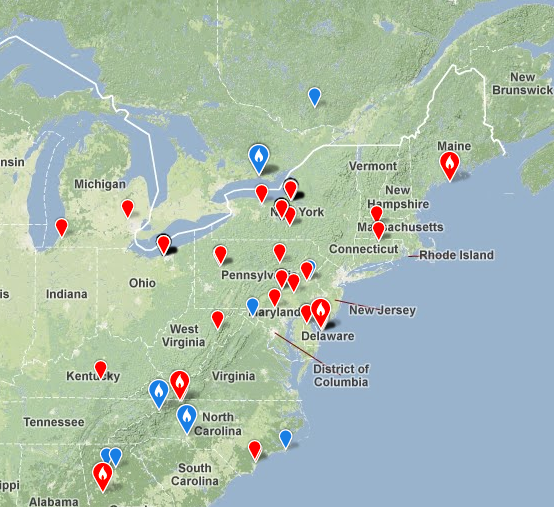 Fall of 2012 has shown a huge invasion of Selasphorus hummingbirds into the northeastern United States. Writing this from Maine, we have had two but Pennsylvania is off the charts: 30+ reports and they keep coming. The amount of rufous on the flanks and base of the tail feathers definitely indicates a Selaphorus hummingbird. BUT R1 looks all green, with just a slight black edging near the tip. R2 shows just a little rufous peaking out from under the upper tail coverts but there does appear to be a minor notch. R3-5 have plenty of rufous at the base but at least we can see the width of R5 rules out Allen's. One very interesting note was that female hummers can show colored feathers on the gorget. (fun fact for this east coast birder) This bird does show two reddish-orange feathers off-center on the gorget but has been identified as a female. 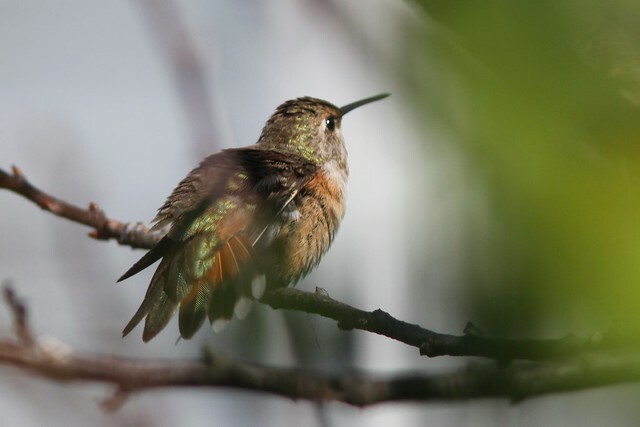 While there are good features here for Rufous Hummingbird, most are also in the realm of Broad-tailed Hummingbird, which has never occurred in Maine before. How else can this bird be identified? The easy answer would be to band the bird, except the nearest bander we can find with the proper permits lives about 3.5 hours away and is not immediately available. 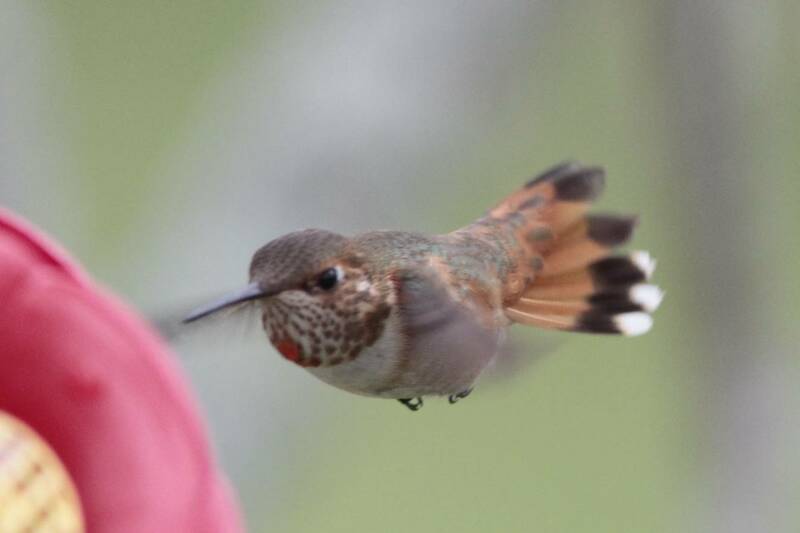 It doesn't take long to realize the our bird has a very similar pattern to the Rufous Hummingbird: both showing that two-layered backward J shape, very different from the down-slured shape of the Broad-tailed. But is this significant? I have two recordings of our bird and could only compare to what is available on xeno-canto; there are no female Rufous recordings there. I have to say this bird is looking closer to a Rufous than Broad-tailed. 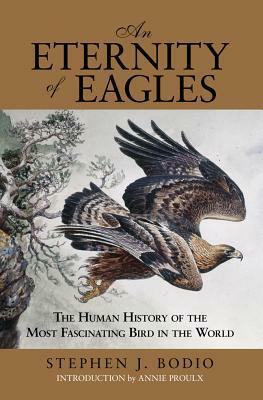 Until I hear an expert opinion on audio or we get the bird in the hand, I think it can only be called a Selasphorus sp. It's time for a quick Birds at Large update to show a couple ways birds are being used - and misused - in regular culture. Yes? OK. The Black-capped Chickadee is Maine's state bird. The state bird! And this is how they reproduce it? Gray flanks? Black back? Maine - my beloved home state - should be ashamed of itself. How are folks going to respect a vaunted institution like gambling if they can't get the details right? Your browser does not support iframes. This dazed and confused sparrow made headlines this week by showing up on the Yankee Stadium infield and not leaving. Good way to save $2,600, I suppose. Hope the guy's OK. In other baseball news, the Baltimore Orioles - the team I've long trumped as the best bird-related team in pro sports - is in the playoffs for the first time in over a decade. Good luck, Os! There is a big fight on the Outer Banks these days about limiting the use of off-road vehicles on the beaches where they might interfere with nesting birds. This sign I saw on my way back from a Hatteras pelagic is in reference to the conflict. Classy stuff!